Telling Lies (debut performance, Nagoya, Japan, 1996). Telling Lies (live, Loreley Festival, 1996). Telling Lies (live, Phoenix Festival, 1996). Telling Lies (Adam F. mix). Telling Lies (A Guy Called Gerald “Paradox” mix). Telling Lies (50th Birthday concert, 1997). Telling Lies (NPA Canal, 1997). He had dreaded the idea of touring but now found he’d acquired a taste for it again. Four months after the Outside shows ended, Bowie was back at it, playing a string of Asian dates and European festivals during the summer of 1996. He’d fleshed out his new songs, he’d gotten a kick from the warring audiences that he and Nine Inch Nails had summoned. And he’d fallen in love with the core of his touring band: Gail Ann Dorsey and Zachary Alford, Reeves Gabrels and Mike Garson. With Alomar gone, it fell upon Gabrels to play all of the guitar parts, which led to ever more flamboyant, effects-heavy performances. The set-lists were punchier in the Festivals tour: Bowie debuted his version of “Lust for Life” and went back to glam with “Aladdin Sane,” “All the Young Dudes” and “White Light/White Heat.” Having to compensate for losing Alomar’s rhythm playing also let Bowie indulge in a new interest: jungle-inspired percussion loops. Having already experimented with jungle-esque beats on Outside tracks like “I’m Deranged” and “We Prick You,” Bowie and Gabrels, working with the producer Mark Plati, spent a few weeks before the tour crafting samples of beats, synth patterns and guitar lines for use on stage. Whenever Earthling is disparaged, it’s often due to Bowie’s incursion into drum ‘n’ bass: “Bowie’s jungle safari.” “Grandad playing at break-beats,” etc. Why did this particular vampirism earn ridicule while Bowie’s earlier absorptions of funk, Krautrock, etc. were acceptable? Sure, some of it was age. Bowie was nearing 50, and to some he looked like a man in flagrant denial of that fact: dying his hair copper (to let fans see him better on stage during daylight shows, he said) and growing a satyr’s goatee, flailing around on stage in Alexander McQueen frock coats. Bowie said that drum ‘n’ bass (which he allegedly first heard in London in late 1992) was the most exciting thing he’d heard since reggae. Which was an odd comparison: Bowie had rarely mentioned reggae before, had seemed little in tune with it, and his few attempts at reggae in the mid-Eighties had resulted in some of the worst recordings of his life. (Arguably his best reggae track is “Ashes to Ashes.”) He’d always been a dilettante, a proud one, but he’d been a consistent one. Buddhism, mime, Krautrock, science fiction, soul, Scott Walker, chanson, the Velvet Underground, etc. : these were all long-established channels of influence, ones that Bowie could return to whenever he was running dry. By comparison, his immersion in drum ‘n’ bass seemed synthetic—a new grafting onto an old tree trunk. Another factor in the reaction to Earthling was how jungle was treated by the music press (again, I offer an American perspective here). There seemed to be a press consensus that pop music moved in easily-definable cycles, usually coming in four- or five-year increments, so by the mid-Nineties it was time for a fresh spin. Grunge was dead, Britpop was going nowhere in the US, so the apparent pact was to make “electronica” the Next Big Thing. Hence lots of features and hype on Roni Size and the Chemical Brothers, ca. 1996, which didn’t translate much into radio play or record sales. Someone must have been telling lies about Joseph K., for without having done anything wrong he was arrested one morning. 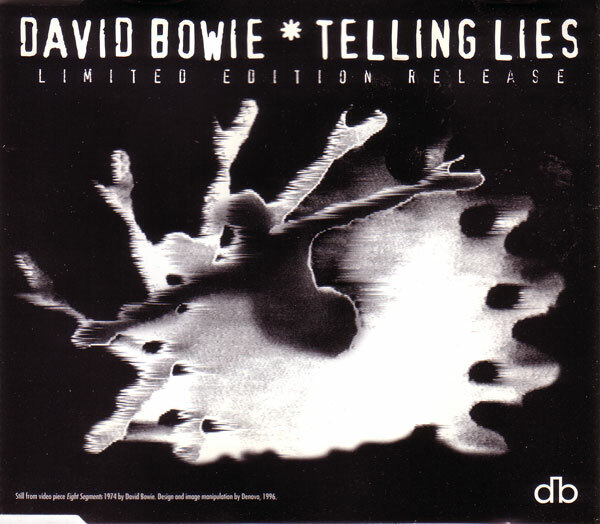 Before the tour resumed, Bowie assembled his band in New York in mid-May 1996 to rehearse and to do some recording (including samples for the upcoming live shows), including cutting a basic version of “Telling Lies.” The band played it throughout the tour, generally the version that wound up on Earthling,** while Bowie farmed out a mix of “Telling Lies” to a few DJs and producers for prospective mixes. As a song, “Telling Lies” suffered from being a guinea pig. A vague shamble between A minor and E major, its structure consisted of two intriguing verses affixed to bludgeoning, overlong choruses. Bowie’s vocal melody was a stitchwork of some obvious steals: the verses had the rhythm and melodic flavor of Leonard Cohen’s “The Future,” and, more subtly, Eno’s “Fat Lady of Limbourg,” while the chorus even had a pinch of the Beach Boys’ “I Guess I Just Wasn’t Made for These Times” (cf. “sometimes I feel very sad” in the latter to “feels like something’s gonna happen this year“). And there’s a heavy-handedness to the “rock” choruses, with Bowie discarding the intricate dialogue of heavy bass/clattering, pilled-up treble of the best jungle tracks in favor of a sludgier bottom end. Much as how the percussion loops were barely-altered versions of those on “We Prick You,” most of its lyric seemed like Outside rejects. But if baffling and clunky on record, lines like “gasping for my resurrection” and “come straggling in your tattered remnants” came alive on tour, with Bowie playing a Satanic figure in his performance, coming across as an aging imp of the perverse. As a transition piece, “Lies” worked well, getting the band into the frame of mind for what would become Earthling. When they got off the road, Bowie hustled to take a “sonic photograph” of them in the studio before they lost their tour-hardened sound. Recorded ca. March-April 1996, Mountain Studios, Montreux; ca. mid-May 1996, August 1996, Looking Glass Studios, New York. Released, in Mark Plati’s “Feelgood Mix,” as a download on 11 September 1996 and as a 12″ single (RCA/BMG 74321397412) in November 1996. 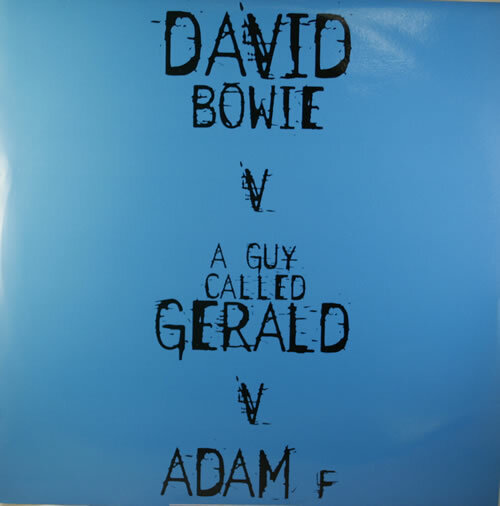 A Guy Called Gerald’s “Paradox Mix” and the “Adam F mix” also were issued as downloads in September. The album mix is, unsurprisingly, on Earthling. * One thought on where the title line may have come from; likely a wrong guess. For those interested in the minutiae of translation, I recommend this piece on the perils of translating Kafka (the opening line of Der Prozess should more accurately read “slandered” instead of “telling lies,” which gives a more bureaucratic, legal flavor to the clause). ** The main differences between the 1996 live performances and the LP version was a different opening line for the second verse (the very Outside-sounding “see me bowing to torture’s pain“) and Bowie occasionally singing “starting fires!” in the chorus, an obvious nod to the Prodigy (at Loreley, Bowie made the sign of the horns in tribute). 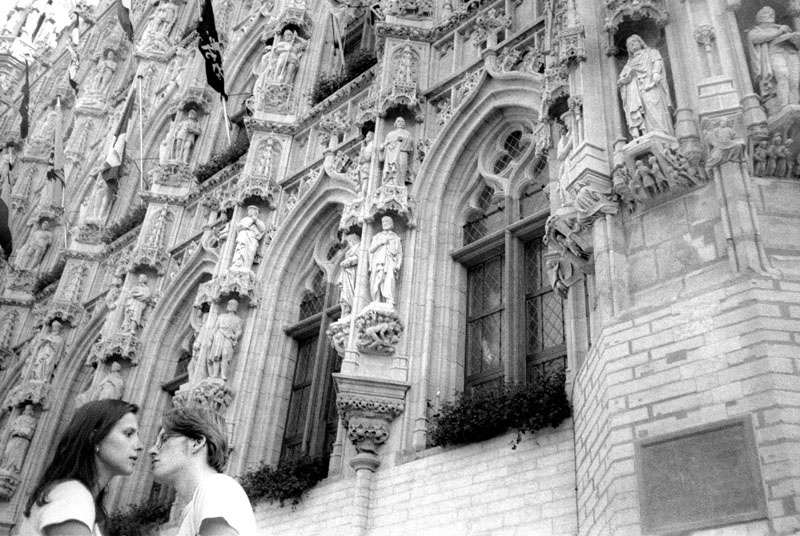 Top: Christian de Prost, “Belgique, Leuven,” 1996; lies, lies, lies.